Imagine you're tooling through the countryside in Provence. It's a midsummer afternoon, maybe in the late 1920s if you want to be extra romantic. All around you, as far as the eye can see, row after purple row of lavender waves in the breeze.The aroma is inescapable, intoxicating. A floral bath. Doing their work among the fields are honeybees. Lavender honey is practically steeped with the sunshine and vibrant color and sense of contentment of those fields. You could get a jar and drizzle it in your tea or on your yogurt. 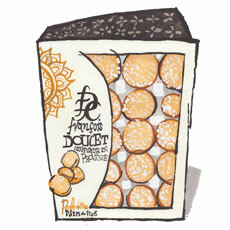 Or you could get a box of these gumdrop-like pâtes de fruit and eat it straight. From third generation confectioner François Doucet, these golden-yellow morsels practically burst out of the box with the flavor of lavender honey. Smooth, sweet, and slightly earthy, these soft, chewy confections make wonderful treats anytime of day. Each box contains 20 candies, each one big enough to eat in about two big nibbles.